Taking your hands off the road. 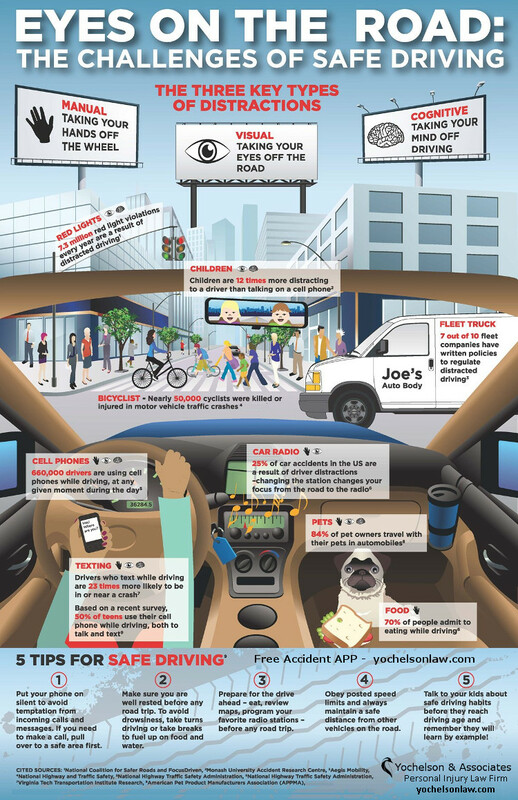 7 out of 10 fleet companies have written policies to regulate distracted driving. 660, 000 drivers are using cell phones while driving at any time given moment during the day. 25% of car accidents in the US are a result of driver distractions – changing the station changes your focus from the road to the radio. 84% of pet owners travel with their pets in automobiles. 70% of people admit to eating while driving. Drivers who text while driving are 23 times more likely to be in or near a crash. Based on a recent survey, 50% of teens use their cell phone while driving, both to talk and text. Put your phone on silent to avoid temptation from incoming calls and messages. If you need to make a call, pull over to a safe area first. Make sure you are well rested before any road trip. To avoid drowsiness, take turns driving or take breaks to fuel up on food and water. Prepare for the drive ahead = eat, review maps, program your favorite radio stations – before any road trip. Obey posted speed limits and always maintain a safe distance from other vehicles on the road. Talk to your kids about safe driving habits before they reach driving age and remember they learn by example.